Comedy in Tooting south London! Comedy Trumpet is Colin & Rob's monthly comedy night in Tooting Broadway, south London. 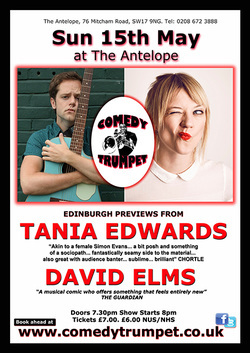 On the third Sunday of each month, your hosts will be bringing you top notch comedy from some of the biggest & best comics on the circuit at The Antelope. With great comedy, great food & drink and NUS/NHS discounts, it's the perfect way to finish off your weekend. Add us on Facebook and Twitter to get all the details as they're announced. Just some of the acts that Colin & Rob have had on in sunny Tooting.